I went into Volume almost completely blind. 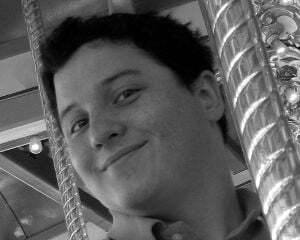 After playing and loving Thomas Was Alone, all I needed to know was that Mike Bithell was making a new game, and I was in. I don't know what I was expecting, but it wasn't a cyberpunk retelling of the Robin Hood mythos through stealth gameplay. That's not a bad thing in itself. Volume does a lot of things well, and it is enjoyable overall. However, it suffers from a few issues of varying severity that prevent it from achieving greatness. 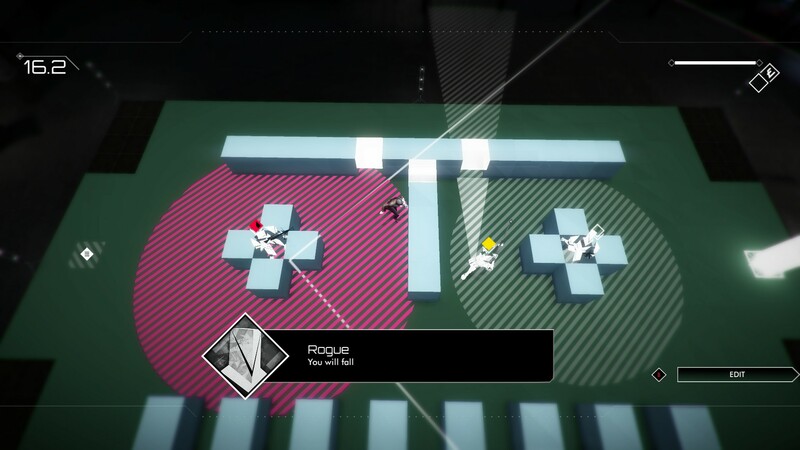 Bithell has cited Metal Gear Solid as an inspiration for Volume, and the similarities are easy to see. 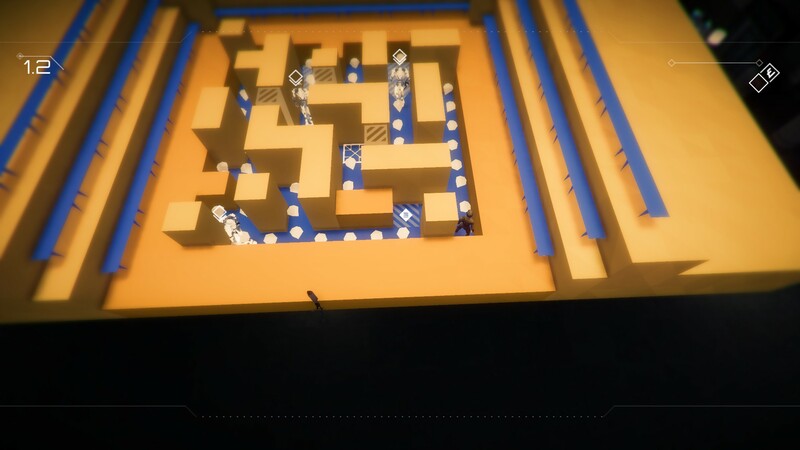 Specifically, it evokes Metal Gear Solid: VR Missions with its simplified visuals and a structure that follows a string of small, self-contained rooms to clear. 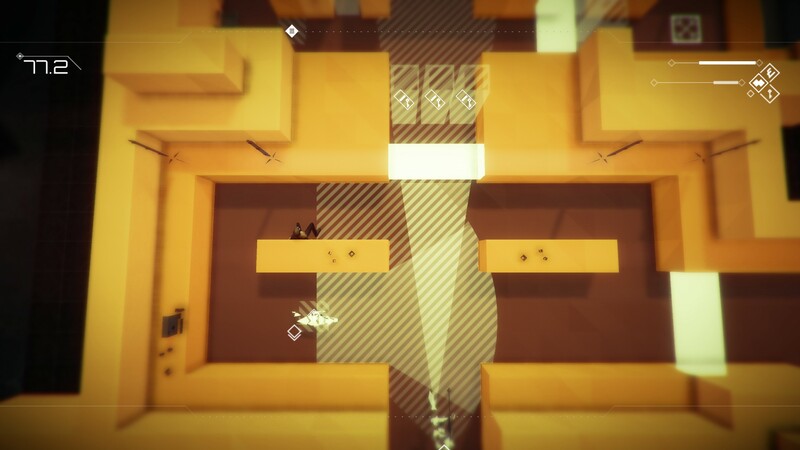 Volume is more stealth puzzle than stealth action, with some levels leaning further than others in the pensive direction. The starkly colored, clearly delineated environments work exceptionally well to communicate important gameplay information. Coupled with the enemy vision cones laid directly onto the floor and the visible sound radius, there is never any question what might have set a particular guard off. Protagonist Robert Locksley (get it?) starts off with nothing but his wits and whistle. He defaults to a slow, sneaky walk and can crouch lower behind single-block walls to stay out of sight. He is also able to set off sinks and toilets to lure the guards from their posts, or he can just purse his lips and let out a sound that will cause them to hone in on the position. Eventually, a host of gadgets unlock to help Rob on his way. The Bugle can be thrown to cause a faraway noise. The Oddity will hold an enemy's attention regardless of any sounds. The Mute allows Rob to run silently. There are more, and each one feels useful and fun to play with in its own right. Smartly, gadgets are tied to levels and Rob can only hold one at a time, so the right tools for the job are always there without overwhelming the player with unnecessary options. Of course, this gives rise to some occasions where a particular gadget would fit the situation perfectly, but the challenge is in solving that problem with something else. Over the course of the 100 story levels, Rob uses an old "Volume" -- a VR simulator in the future -- to broadcast to the world how to break into properties of the wealthiest citizens and steal their belongings without harming any person. He isn't exactly robbing from the rich and giving to the poor; he's teaching the poor how to rob from the rich themselves. Therein lies a bit of a discontinuity between gameplay and narrative. The more gamey aspects of Volume work well in the context of having clear objectives and solve puzzles, but when Rob broadcasts himself alerting every guard and touching the exit square just as he's about to be shot, it doesn't really make sense for somebody to want to replicate that performance in the real (in-game) world. A worse offender in this regard is with the checkpointing, which, like most of Volume's gameplay elements, is very lenient. By touching a checkpoint, current progress in a level is saved, but enemy locations are reset upon restarting. It's clear why this is the case: it keeps the player from being caught in a death loop if he were to hit a checkpoint just before being killed, but it brings up some edge cases where the fastest solution involves being caught and resetting the enemies. The fact that it doesn't gel with the idea of Rob showing the public how to pull off these heists just adds to the weirdness. The leniency makes Volume a one-and-done type of experience. The par times are easy to hit on the first try for most levels even with a few flubs in play. (I only had to go back and retry two.) I would have appreciated some extra incentive to really master a level, like bonuses for exceptional times or for completing a level without being spotted. Still, even without any added replay value, the campaign runs about six hours; it's not meager by any means. I ran into a handful of bugs during my playthrough, though most were reportedly squashed before launch. I did still encounter one particularly annoying glitch in the level editor, where menu items were constantly scrolling, making it difficult -- though not impossible -- to engage in my usual level editor ritual of making a playable Mr. Destructoid likeness. When I think about Volume, I'm of two minds about it. From a pure gameplay perspective, it handles stealth in a way that always feels fair and, if anything, is almost too forgiving. It conveys information clearly and it's never too frustrating. My biggest complaint of what's here is the ability for a player to cheese through a level, abusing the checkpoint system or the exit square to call something a win despite feeling like a clumsy mess. However, a lot of where Volume suffers is in what's not here. I wish I could pan around a level to formulate a plan before diving in. I wish I were given incentive to play well instead of just adequately. Volume is not a bad game. But it still leaves me wanting for something more out of it.